Really spatchcock is just a fancy way of saying “I cut a whole chicken down the back and laid it flat so it grilled faster” – spatchcock is just easier to say. You can line a brick with foil, heat it up and lay it on top of the chicken and call it Brick Chicken if you prefer. You can skewer it like in the photo – or not. All in all it’s a simple thing to do and you can season your chicken any old way you please and still call it spatchcock – funny word – isn’t it? Regardless of what you call it or how you season it bottom line: it does decrease your cooking/grilling time considerably! This one was inspired by one of my recipes at the store except here I used fresh herbs – I’m not convinced that the fresh herbs made one iota of difference which is too bad because my herb plants are now bald. …off the subject here…remember Patty’s cat Iota!? Process to a paste then spread all over the bird and under the skin as much as possible. Place in Ziploc bag and let marinade a couple hours or so. Grill on a pre-heated grill and well oiled grate skin side down first. Optional to cut a few lemons in half and grill them as well to squirt over your finished masterpiece. Grilling the lemons is just for show – it imparted no extra flavor whatsoever. It looks go good! Can I have a piece? The Greeks call it spatchcock, the South Africans call them flatties. Maybe spatchcock is greek for flattie. Nando’s uses a peri peri marinade for a full day. Man, do I miss Nando’s. I think spatchcock is English, not Greek, but how do you say delicious in Greek!! OOMPAH! 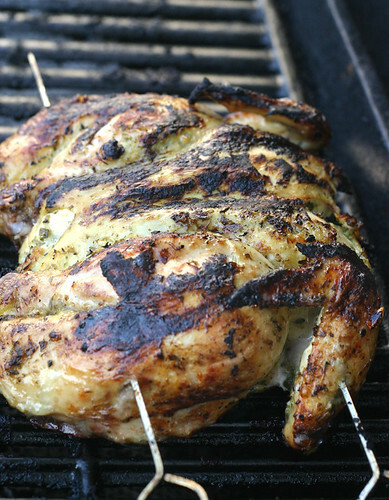 I love greek grilled chicken, and I love butterflying a whole chicken and grilling it, so much easier and more delicious b/c you get more surface area grilled. YUM! Can’t wait to try it! 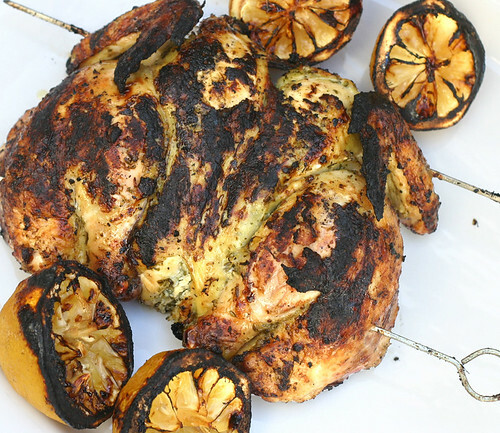 Yes – I think I will rename it Greek Marinaded Spatchcock Chicken so there isn’t anymore confusion. Thanks for stopping by and giving it a fourth name – butterfly – how silly of me to have forgotten. Now I’ve got Spatchcock, Brick, Flattie and Butterfly.